Make This Dinner Just Like An Italian Chef. Bon Apetite! When I saw that Ree Drummond posted this recipe I had to check it out. I love all her recipes. I think I started following her when she was just getting started and there was just something personal about her life with Marlboro Man and her kids. It made me want to move out to a ranch! Ree started out talking about taking caer of her family and that is exactly what I was doing as well. Her simple yet delicious recipes really helped me add some fabulous meals to our monthly menu. I love that this recipe calls for tiny little meatballs, so there are plenty throughout this zesty dish. 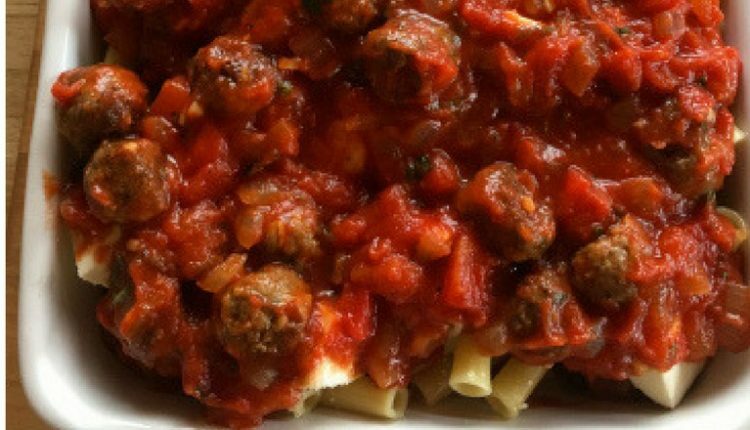 However if you find that is a bit more time consuming than you had anticipated, go ahead and make them a bit bigger, but I will warn you right now, you might as well make a double batch because the meatballs they are going to be such a hit that your family will be diving into the middle of the pasta to find the last one. This is what Ree has to say about her recipe. Quick Tip: You can use whatever kind of sausage is your favorite. I happen to LOVE a Feta/Spinach chicken sausage.